Breakthroughs in nanoengineering often involve building new materials or tiny circuits. A professor at the University of California, San Diego, however, is proving that he can make materials and circuits so flexible that they can be pulled, pushed, and contorted — even under water — and still keep functioning properly. Joseph Wang has successfully printed thick-film electrochemical sensors directly on flexible wetsuit material, paving the way for nano devices to detect underwater explosives or ocean contamination. Wang notes that some members of his team — including electrical-engineering graduate student Joshua Windmiller — are surfers. 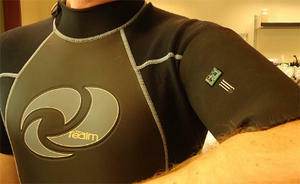 Given the group’s continued funding from the U.S. Navy, and its location in La Jolla, it was a logical leap to see if it would be possible to print sensors on neoprene, the synthetic-rubber fabric typically used in wetsuits for divers and surfers. A university of California-San Diego release reports that the result is the development of “wearable electrochemical sensors for in situ analysis in marine environments.” The paper, published last month in the journal Analyst , was co-authored by UCSD’s Wang, Windmiller, and visiting scholar Gabriela Valdés-Ramírez from Mexico, as well as Michael J. Schöning and Kerstin Malzahn from the Institute of Nano- and Biotechnologies of Germany’s Aachen University of Applied Sciences. UCSD has a full U.S. patent pending on the technology, and has begun talks on licensing the system to a Fortune 500 company. Wang’s 20-person research group is a world leader in the field of printable sensors. To prove that the sensors printed on neoprene could take a beating and continue working, some of Wang’s colleagues took to the water.